Timaeus of Tauromenium (350-260 BC) wrote the authoritative work on the Greeks in the Western Mediterranean and was important through his research into chronology and his influence on Roman historiography. Like almost all the Hellenistic historians, however, his work survives only in fragments. 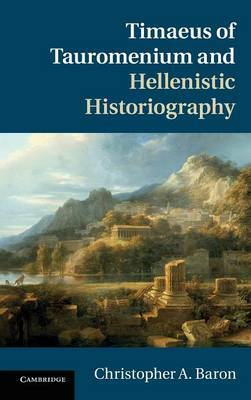 This book provides an up-to-date study of his work and shows that both the nature of the evidence and modern assumptions about historical writing in the Hellenistic period have skewed our treatment and judgement of lost historians. For Timaeus, much of our evidence is preserved in the polemical context of Polybius' Book 12. When we move outside that framework and examine the fragments of Timaeus in their proper context, we gain a greater appreciation for his method and his achievement, including his use of polemical invective and his composition of speeches. This has important implications for our broader understanding of the major lines of Hellenistic historiography.